The Mazagaom Bunder, with a vessel stranded [Bombay]. bl.uk > Online Gallery Home	> Online exhibitions	> Asia, Pacific and Africa Collections	> The Mazagaom Bunder, with a vessel stranded [Bombay]. 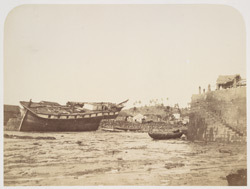 Photograph of Mazagaon Bunder, Bombay from 'Views in the island of Bombay' by Charles Scott,1850s. In the 1770s since Bombay began to trade in cotton with China and exports of other goods from Bombay increased, the British decided to build a new dock at Mazagaon, which lay east of the main island of Bombay. The area developed due to the growth of trade and subsequent economic prosperity of the town. Land reclamation projects in the 19th century joint the islands making Mazagaon landlocked and losing its prosperity to neighbouring areas.